On a visit to Barnes and Nobles, my hubby bought The best ever book of Bread by Christine Ingram. You know I am a bread addict, and love to bake bread. This book is full of colorful photos and information about a large variety of breads. I have to try a lot of bread, and it will take a few years to finish that book. While turning the pages I fell in love with this bread. So decide to bake first. In the last one year, Syria is now known for its war, however it’s earlier known for its deserts and ancient ruins, and just like any other country its has its own cooking. The capital city is Damascus and other main cities are Aleppo and Homs. According to Wikipedia Syrian onion bread comes under the part of appetizer in Damascus cuisine. Za’atr is the major spice blend commonly used in the Middle East, with its regional differences (just like Garam Masala from India). Za’atr from Damascus is less sharp and peppery than the version from Aleppo. I bought a pack of za’atr spice blend however has not used yet this. This bread recipe doesn’t require that. 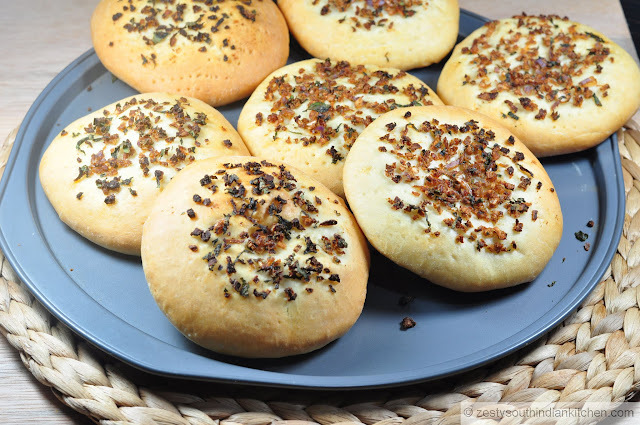 While looking at the recipe I found similarities with single-layered manaqish, Lebanon’s breakfast bread, in the way of using topping and also shape similar to any round Arabic bread and look similar to our own Bilays. One afternoon, while babies were taking a cat nap I started making the dough. I used both All – purpose flour and bread flour to make it less chewy. If you want to follow the original recipe you use only the bread flour. 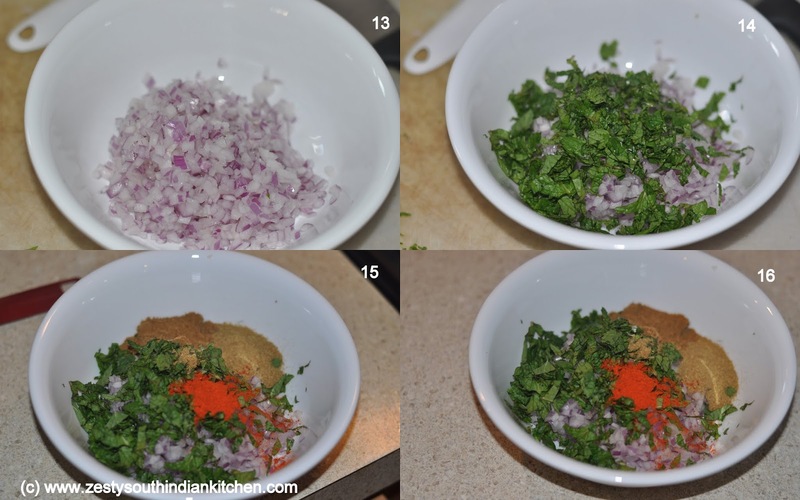 I found that recipe measurements were little off, so I corrected by my own intrusion and increased the filling amount, however reduced the coriander powder amount as my hubby is not fond of it, and added a little chili powder. While baking bread, it was giving out intoxicating aroma with all onion and mint, cumin, coriander and red chili powder. It was so delicious when it was out the oven. With my corrected version I was able to get 9 bread, however I will ask you to make 12 bread so it will be less thicker than mine. Next day too they are fine, but one thing I found that topping have the some age old problem with bread, they started coming off if you tilt or turn the bread, so you have to eat bread holding upright position. My original idea was to eat it with soup or curry, but when we started eating them, we ate it just like that without any add-on. If you want a change from your usual breads, try this. 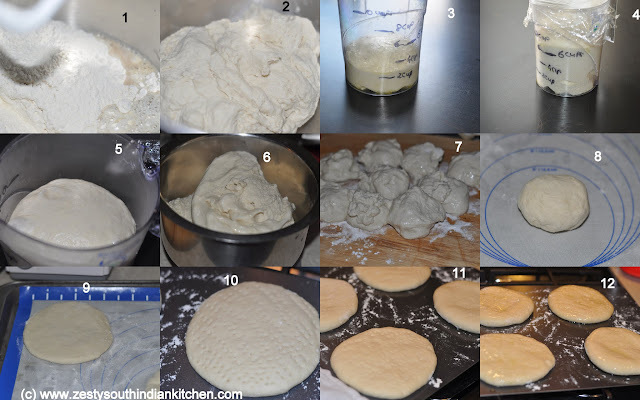 At first make the dough using all purpose, bread flour, salt, and yeast. I used instant yeast. If possible weigh the flour and other ingredients. In a bowl of kitchen aid stand mixer dump all flour, salt, yeast and water gradually to form smooth dough and knead for about 10 minutes. Transfer to lightly greased bowl and set aside for rise or yeast to do its job. Once it doubled in volume, it took about 75 minutes. Transfer to well floured surface and divide into 9 -12equal pieces. Flat it into a circular disc of about 5-6 inch round, prick all over using fork and transfer to baking sheets cover with a kitchen towel and set aside for another rise to 20 minutes. In a small bowl add chopped onion, mint, cumin, coriander powder and chili powder and mix everything so that spices get mixed well. When you are ready for baking, brush circles with olive oil and sprinkle topping mixture while sprinkle do it from little height to get uniform topping. Bake for about 30 minutes or until sides becomes brown. In a bowl of kitchen aid stand mixer add both flour, salt and yeast and gradually add to water to form a sticky dough. Knead the dough for about 8-10 minutes to form smooth dough. or doubled in volume. It took about 75 minutes. over to prevent puffing in the oven. aside covering with kitchen towel for about 20 minutes. While dough is doing its second rise . Skip Chili powder if you want follow original recipe. I am linking to Hearth and Soul Blog Hop hosted here. Lipsmacking good bread Swathi. Love your detailed presentation dear. Wow, onions in bread that soo marvellous..They came out super cute and absolutely incredible. Very impressive swathi. This one is new to me. Am bookmarking it. Perfectly baked bread.. Neat Presentation.. The bread looks nice. And you have added a few variations and made it your own! The bread looks so delicious! I would love a roll. Please join us on Friday for Foodie Friends Friday! Oh my!!! what flavourful appetizer….They look soo good and perfectly baked.. Perfectly puffed soft buns,yummy flavors too!! Your bread is fantastic!!! Beautiful and yummy, my friend! What delicious looking buns! I would love to smell these baking in my kitchen! Your onion bread looks delicious! I love the ingredients and fragrant spices. Wow, that’s my kind of bread! I imagine how delicious it smelled while baking! The bread’s baked very nicely! Cute shape! Gosh, this is so good and attractive. Please don’t make me hungry now. Need to have my bath and yum after seeing your pics. These onion bread look so wonderful! I love the topping! It came out great…. 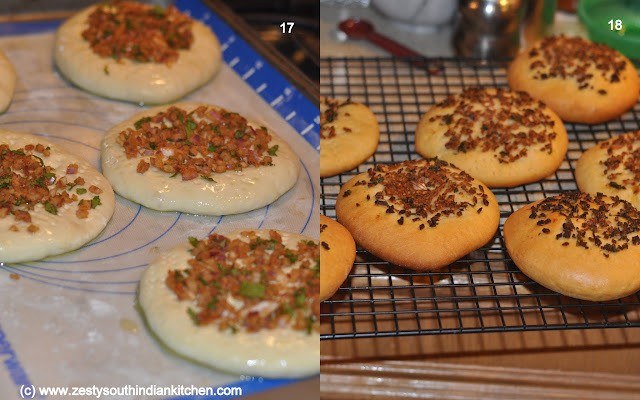 Mmmmm….This savory buns look so good, Swathi! These are absolutely perfect Swathi! I love the seasonings! You’re such a talented bread baker. I haven’t had a chance to tell you but I love the theme for this month’s baking partners. It is something I need to really work on. Try it soon. Ur clicks looks amazing. And the bread is perfectly baked. beautiful bread. best wishes on bijaya dashami. A great presentation with lovely detailed instructions. These are reminding me of pizzettes (miniature single-serve pizza)a little. I like the topping and agree you have to be careful of losing portions of topping. Man alive, when you said bialy it brought back memories, I haven’t had one in years (decades). Used to could find them wherever bagels were sold. When it comes to bread you are the foremost authority. James Beard has nothin’ on you. Anthony I am flattered by your Compliments,. James Beard is genius, It will take a long years for me to reach that level. wow such a beautiful bun and I especially loved the topping. A must try!! Exquisito y muy lindo me encanta gran trabajo,abrazos y abrazos. Wow…just look at all these comment for your amazing and perfectly yummy Syrian bread. 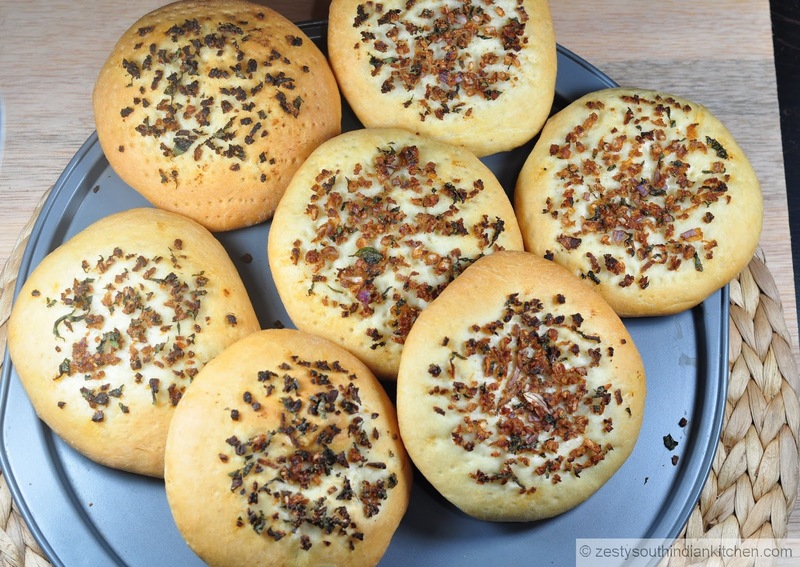 Just love, love, this kind of bread, especially the amazing onion, topping with the spices, and mint. Yumm!!! I love all the wonderful flavours you have used in the topping for your delicious Syrian Onion Bread! This looks like a very tasty bread indeed.